Nick Vitale, of Milltown, New Jersey, was a clever device used by an advertiser to capture an audience in the Wall Street Journal and beyond. An aggrieved consumer from Milltown, New Jersey, took the internet by storm on Thursday with a full-page ad in the print edition of the Wall Street Journal, politely telling America's captains of industry what we all find pretty annoying about their products. 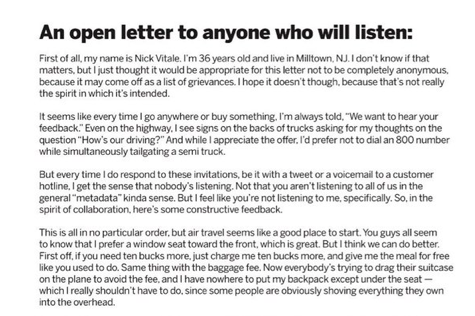 A photo of the letter, purportedly written by a guy named Nick Vitale, circulated on Twitter. It's good for a few knowing chuckles. "On the subject of cheeseburgers, I am generally pleased with the product and service I have received," Vitale wrote. "However, it would be great if you guys could slice both the lettuce and tomato much thinner, so they don’t slide out of the bun when I bite into it. It’s a little thing, but one that I think would dramatically improve the overall experience." The letter tackles airline fees, ride-share tipping, new cell phone models, vehicle dashboards and more. But one brief paragraph was a little suspicious. "Gas stations, I really appreciate that some of you have started putting hand sanitizer dispensers by the pump," Vitale wrote. "What’s taking the rest of you so long?" As we all know, Nick Vitale from Milltown would not be pumping his own gas in New Jersey. The whole thing was part of a two-page advertisement from enterprise software brand SAP, according to AdWeek. The second page featured a playful response from the company, whose North American headquarters are in Newtown Square, Delaware County. A full-page ad in the Wall Street Journal would cost approximately $250,000. A guy like Nick is not going to pay that much to complain about what he's paying for elsewhere. It doesn't seem to matter that Vitale is a fictional character. His words appear to have resonated with the American consumer.